is often the case, some are lingering at MBO into early spring. Censusers: Jean Demers, Leah Den Besten, Réjean Duval, Gay Gruner, Barbara MacDuff, Betsy McFarlane, Chris Murphy, Greg Rand, Clémence Soulard, Elise Titman, Rodger Titman. Notes: According to the calendar, winter has ended, and we are starting our seventh Spring Migration Monitoring Program (SMMP) at MBO! However, we still have a lot of snow on the ground this year, in sharp contrast to last year's unusually early thaw. The road to the site is still impassable by car, and as of the end of the week, the ponds are only beginning to thaw, to the frustration of the Canada Geese that have been checking the site out for nesting potential. No doubt warmer weather will be coming soon though, and by the end of our 10-week spring season on June 5, it will feel more like summer. 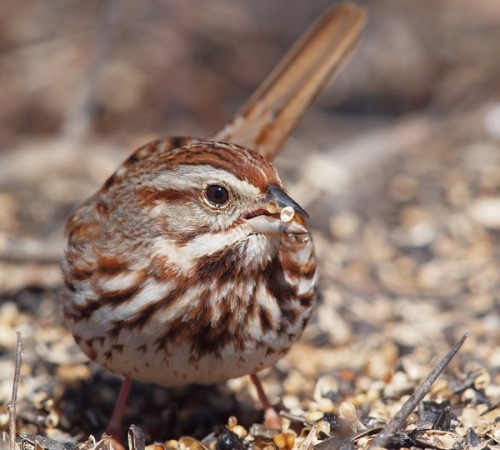 As usual, the first three weeks of our spring program are limited to the daily census and some supplementary incidental observations; full operations including daily banding will commence in week 4, beginning on April 18. This week we observed 32 species, somewhat below our average of 35 for the first week of the spring season; considering the lingering winter conditions this is not surprising. In fact, the count is rather good compared to the 24 speciees observed during this week in 2008, when we also had unusually cold weather. Among the species observed were 8 new arrivals for the year: Snow Goose, Mallard, Northern Pintail, Great Blue Heron, American Woodcock, Eastern Phoebe, Common Grackle, and Pine Siskin. American Woodcock and Northern Pintail are species we don't see every spring, so we are off to a good start! Snow Goose took first place this week, displacing the usual week 1 leader (Canada Goose) to second spot. This is not surprising, given that a phenomenal concentration of Snow Geese was observed this week by many birders in eastern Ontario, with many estimates indicating over half a million individuals were present. The flocks flying over MBO, most notably an impressive 3250 individuals on April 1, were probably on the eastern fringe of that impressive movement. Red-winged Blackbirds were abundant enough to claim third place, in numbers roughly average for this time of year; the first female of the year showed up on March 30. 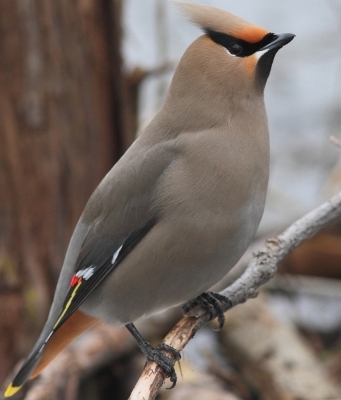 Bohemian Waxwing made the top 10 for this week for the third time in the past four years, reflecting the increasingly regular winter presence of this species in our region. Cedar Waxwings were mixed in with them this week as they both foraged in our fruit trees, giving a nice opportunity to compare the two species. Most of the other species in the top ten are typical early spring birds at MBO, except for Common Redpoll. Previously a single individual in week 3 of 2009 was the only spring record of this species, but this week we still had good numbers on the first two days before the flocks departed. We will see whether there are any stragglers next week, or all have really headed north. An early-returning Song Sparrow taking advantage of some of the remnant seeds around the winter feeders, which have now been shut down until November.